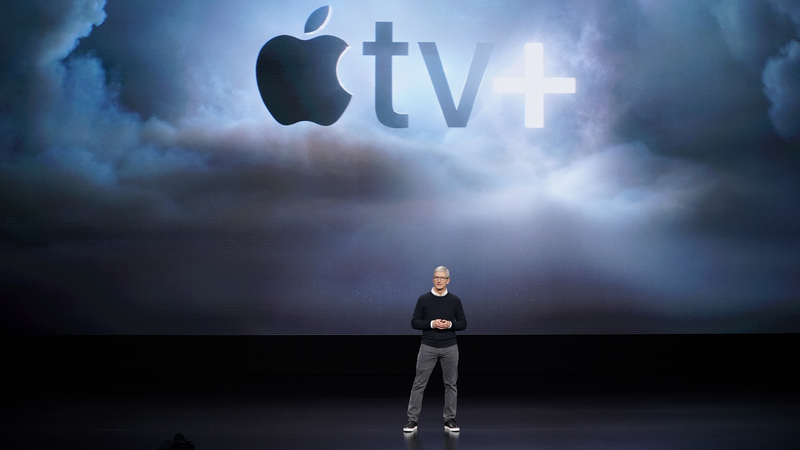 Apple announced Monday a new video streaming service, Apple TV+, to compete with Netflix, Hulu, Amazon Prime and others. It also unveiled a new credit card tied to Apple Pay and Apple News+, a subscription news service. The iPhone has traditionally been Apple's biggest moneymaker, but those sales have been slowing, so the company is looking to make services a bigger part of its business. Apple TV+ will incorporate some existing cable, satellite and other streaming video subscriptions including Hulu, HBO and Showtime. The service, starting in May, will let subscribers pay for only the channels they want in a single app, download shows to watch offline. "It's all together in one place," said Peter Stern, VP of services for Apple at an event in Cupertino, Calif. "No more bouncing from app to app." Apple TV+ will include original programming, debuting this fall, including The Morning Show, a show starring Jennifer Aniston, Reese Witherspoon and Steve Carell; Little America, a series about the immigrant experience with actor and comedian Kumail Nanjiani; and Little Voice, a series by director J.J. Abrams starring singer Sara Bareilles. And Oprah Winfrey is working on two documentaries for the service — one about sexual harassment in the workplace, another on mental health. Apple is entering a crowded and growing video streaming field. More companies are set to launch services this year — including Disney and AT&T, which owns Time Warner. Nearly 60 percent of Americans have at least one streaming service, according to a CNBC survey. There's so much content to choose from that many viewers are frustrated with having to sign up for multiple services to watch the shows they want. Apple is also updating its Apple Pay service to add a virtual credit card, offered in partnership with Goldman Sachs and Mastercard. Users will be able to apply for the new Apple Card on the iPhone and begin using it in a few minutes via Apple Pay. (They can get a physical card for use where Apple Pay is not accepted.) Apple said the card will have no fees and will help users track their purchases by category on their iPhones. Users will get 2 percent cash back daily on all purchases and 3 percent on Apple service purchases. For security, the card number is stored in a chip used by Apple Pay on the iPhone and each payment to merchants is protected by a dynamic security code on the phone. Apple also announced a $9.99-per-month news subscription service called Apple News+ with more than 300 magazines, including The New Yorker, Sports Illustrated, Wired and Food & Wine and news publications including the Los Angeles Times, The Wall Street Journal and the Skimm, a newsletter. "We don't allow advertisers to track you, so what you read on Apple News will not follow you across the Web," said Roger Rosner, Apple's vice president of applications. The company is pushing these new services as iPhone sales weaken. In fiscal 2018, services — including Apple Pay, Apple Music, the App Store and iCloud — represented just 14 percent of the company's revenues. By comparison, iPhones made up 63 percent of sales. But in the most recent quarter ending Dec. 29, which included the key holiday sales period, iPhone sales fell 15 percent from a year earlier — even as revenues from other products and services grew 19 percent. Apple CEO Tim Cook has cited an unexpectedly steep slowdown in China amid trade tensions with the U.S.
Apple is trying to broaden its business in other ways. It's making a push in the health field, adding advanced heart-monitoring capabilities to the Apple Watch and allowing iPhone users to store their medical records in its Health app.